You try to eat right, exercise regularly and maybe even take a multivitamin. Are you hoping that the combination of vitamins you are taking is the right one? Do you know for sure if they are working together for perfect absorption? Why settle for pretty good when you can feel great? Reliv Now® is the answer. Reliv NOW® made with LunaRich® soy powder is a mixture of over 72 vitamins, minerals, herbs, and super-powered antioxidants. Reliv Now® is built on the latest findings in nutrition science. Its uniquely effective formula delivers a balanced array of the most advanced ingredients to give your body what it needs to thrive. Reliv NOW® is vegetarian, certified Kosher and Halal, ideal for those with lactose intolerance, and contain no animal compounds, artificial preservatives or trans fat. Bioavailability. Dissolving nutrients in a liquid shake enables quick, optimal absorption. Synergism. The ideal combination of ingredients in a science-based formula brings out the full potential in all nutrients. Optimal Nutrition. Optimizing key nutrient levels beyond minimum daily requirements leads to greater health benefits and an improved quality of life. Guaranteed Quality Ingredients. A company-owned manufacturing facility, the industry’s top suppliers and rigorous testing mean what’s on the label is in the can — guaranteed. 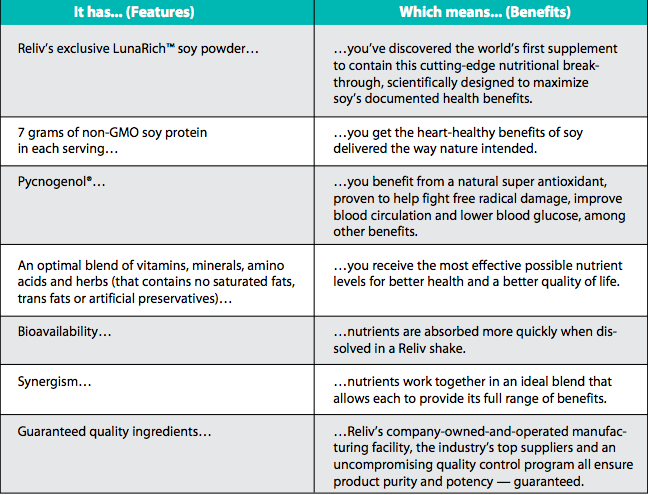 LunaRich® is the most advanced soy powder on the market today — and it’s only available from Reliv. Research shows a naturally occurring soy peptide called lunasin is responsible for many of soy’s remarkable health benefits. Reliv’s exclusive LunaRich soy powder contains five to ten times the bioactive lunasin of ordinary soy powders. Reliv Now® goes beyond a standard multivitamin pill, giving you more of everything your body needs. Vitamins & Minerals: contains more vitamins and minerals than leading multi- vitamin pills, in an easily absorbable liquid form. You get double the amount of vitamins B and E, and as much as eight times the vitamin C. In addition, Reliv Now delivers higher levels of essential minerals such as copper, zinc and calcium. Antioxidants: provides many antioxidants not found in popular vitamin brands, including patented Pycnogenol® — one of the most cutting-edge ingredients available today. More than 170 studies have demonstrated Pycnogenol’s ability to fight free radical damage, improve blood circulation and lower blood glucose, among other benefits. Protein: packs a powerful protein punch. Doctors recommend 50 grams of protein daily, but most multivitamins contain none. Reliv Now® gives you 7 grams per serving of the highest-quality, healthy soy protein available. If you’re looking for cutting-edge nutrition, it’s time for Reliv Now®. Reliv and Lunasin. The soy peptide lunasin is one of the first dietary ingredients identified to affect gene expression and promote optimal health at the epigenetic level. With lunasin, you really can take control of your health. Epigenetics holds the key to a healthier future. Cholesterol management blood pressure, diabetes, weight, cancer, headaches, migraines, pain, chronic pain, fibromyalgia, sciatic pain, back pain, kids nutrition.